As a young child, he’d known the way he looked on the outside didn’t match how he felt inside. He didn’t like the dresses with lace frills that he was made to wear and longed to play with toy soldiers and trucks instead of dolls. When puberty hit, his changing body felt even more foreign. “I had all these features I didn’t identify with,” he says. It took him several years to find the body he was truly born to be in. Landa Mabenge, who was born and raised as a girl, started the lengthy and intricate process of transitioning in 2009. 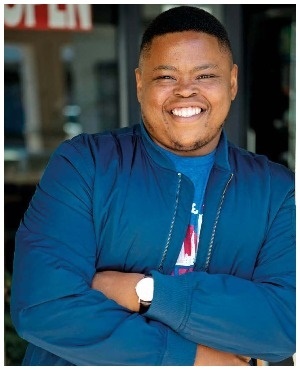 Now the 37-year-old activist is the first known transgender man in South Africa to get a medical aid to fund his gender- affirming procedures. He tells his triumphant story in the book Becoming Him, A Trans Memoir of Triumph. His journey certainly hasn’t been a smooth ride: his childhood was marred by abandonment and abuse. At one point Landa tried to commit suicide for fear of facing his “cruel” parents, Nokuzolaand Victor, whom he calls “The Mother” and “The Father” in his book. When he was two days old his mother gave Landa to her sister, Nomha Vuyelwa Danana, to care for. At the time Nokuzola was living in an outside room with Victor in Port Elizabeth and told Nomha she could have the child to keep and raise as her own. Landa was raised by Nomha, whom he lovingly calls Ma, and his maternal grandparents in Ncambedlana, Mthatha, until he was 11. When his grandfather fell ill, Nokuzola returned to take Landa to live with her and Victor in Port Elizabeth in the home they shared with the couple’s two younger children, and his older brother Tando, who had also been raised in Mthatha as one of many children under the care of their maternal grandparents. Landa found living with his new family a nightmare. His parents were prone to violent outbursts and in his book he recalls how his father broke Tando’s jaw. Fearing for his life, he says he kept his secret to himself. The man sitting in front of us is a far cry from the tortured teen he describes in his biography. He’d always wanted to document his story but and admits his initial reason was to take revenge on his parents, who have both since died. Landa, a motivational speaker who lives in Cape Town, met publisher Melinda Ferguson at a book launch in May 2017 and reached out to her shortly after, asking for her help with writing his memoir. “You’re putting your life out there for people to pick apart,” he says – but it was important for him to tell his tale. Landa’s book sheds light on his transition process – he started hormone therapy after his parents’ death in 2009 – and details exactly what it entails, including having check-ups every six months to ensure the dosage is correct. “When you go on hormone treatment you are susceptible to a lot of things like cardiac failure and high blood pressure,” he explains. Then there are the medical bills. Four years after Landa – who was working for Discovery at the time – had started hormone therapy, his transition stalled due to a lack of funds. To undergo all the surgeries required would cost close to R500 000 – an expense Landa’s medical aid refused to cover. With the help of a friend, Landa withdrew from Discovery and applied again through Bankmed CareCross as a spouse dependant. In June 2014, a little over a year after he started the process, his surgeries were finally approved with them. His first procedure was a double mastectomy that took surgeons at the UCT Private Academic Hospital just under six hours to complete. With each passing day Landa began to feel confident in his new body and while his gogo accepted him, he’d never reconciled with his parents, both of whom died of diabetes. He still undergoes hormone replacement therapy, at his own cost, and Landa says he’s made peace with his past. “I’m much further along the path to forgiveness than I was, but it’s a work in progress,” he says. He’s come a long way from the child who grew up feeling different and neglected and says he wouldn’t be the man he is without the support of Yonga Jizana, his girlfriend of three years. The pair have known each other for a decade and both are from Mthatha. He laughs when we ask if he’ll walk down the aisle or have kids one day. Marriage is a remote possibility, Landa says, but it’s a definite no to children. For now he’s enjoying the feedback on his book and the newfound freedom of finally being able to live life on his own terms.